We’ve teamed up with MikroeElektronika to issue a challenge to all hardware designers out there. 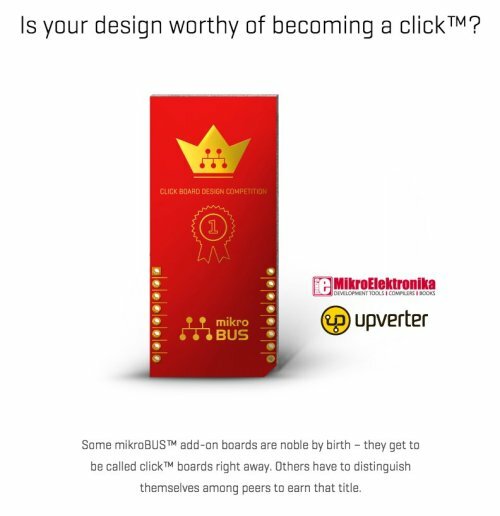 Before September 18th, design and submit an innovative mikroBUS™ add-on board. 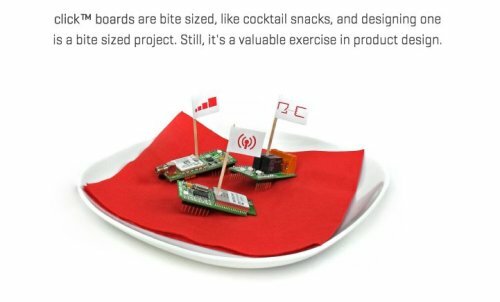 If your project rises above the competition, your board will be manufactured and marketed – it will join the Most Excellent Order of MikroElektronika click™ boards. And you, the champion, will be showered with $6500+ worth of prizes from Upverter and MikroElektronika. New To Click Boards ? click™ boards are add-on boards with a standardized mikroBUS™ pinout that make hardware prototyping as elegant as it gets. Each board carries a single sensor, transceiver, display, encoder, connection port or any other sort of chip or module. There are currently more than 130 of them. 1. Idea: Will your board be useful to end-users? What’s it for? What’s the short term and long term market availability and price of the BOM? Is there a novelty factor to your design and the technology it’s based on? 2. Design: Is the main chip or module used to its full potential? How functional is the layout? (for example, if the click board has a pushbutton on it — is it placed on the optimal position? Did you do your best with routing the board? Did you follow the guidelines of the particular chip or module’s producer? 3. Final Touch: Did you come up with a cool name? Silkscreen illustrations? There are three sizes you can work with: Small, Medium & Large. To better understand all the possibilities and constraints of mikroBUS™ download the official spec document: HERE. 1. 5x winning click™ board and a special commemorative plaque for bragging rights, and the winning design gets manufactured and marketed. as many designs as you like. Terms and conditions apply.